The supplements have been detailed for the two Academy Award-winning dramas getting the high-definition treatment this October. As previously reported, Lionsgate has just revealed 'The Cider House Rules' and 'Life is Beautiful' are coming to Blu-ray on October 4. 'The Cider House Rules' snagged two Oscars for Best Supporting Actor (Michael Caine) and Best Adapted Screenplay (John Irving), while 'Life is Beautiful' was nominated for seven and won three including Best Actor for Roberto Benigni. 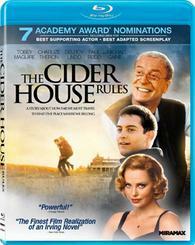 Specs have yet to be revealed, but 'The Cider House Rules' will include Filmmaker Commentary, The Making of The Cider House Rules, and Deleted Scenes, while 'Life is Beautiful' will have The Making of Life is Beautiful and the theatrical trailer. Suggested list price for each Blu-ray is $14.99. You can find the latest specs for 'The Cider House Rules' and 'Life is Beautiful' linked from our Blu-ray Release Schedule, where they're indexed under October 4.